What is a restaurant invoice? 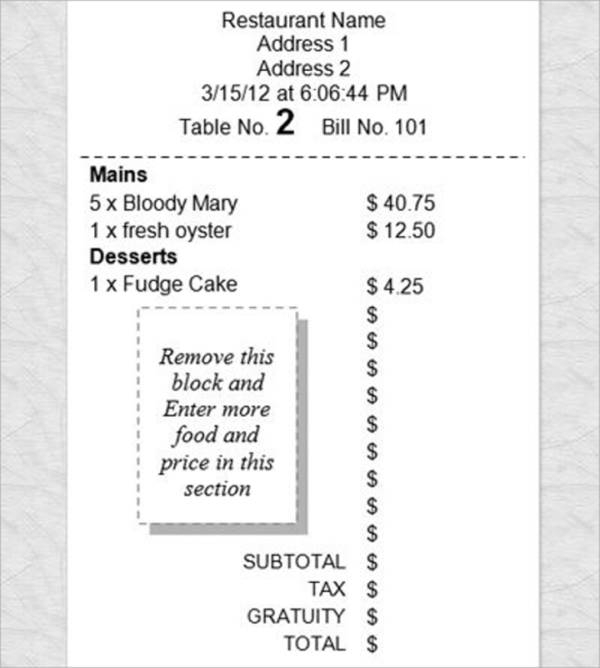 A restaurant invoice is an invoice that is specifically made for use in the restaurant setting. When asking for your bill after a meal in a restaurant, an invoice is issued to the customer as means of telling them about the food they had ordered and how much they have to pay for it in total. There are many varieties of restaurant invoices that are unique to every restaurant business. Different samples and templates are provided in this article for anyone who wants to view or make their own restaurant invoice for their restaurant business. Basic and useful information about restaurants are also provided for your convenience. Have you ever asked yourself why restaurants still provide you with an invoice before making your payment. I mean they can plainly tell you how much you need to pay, just like how they do it in fast-food chains. To understand restaurant invoices better, let us know more about their uses. You may also see billing invoice samples. 1. A restaurant invoice is used to politely ask or require payment from the customer for the food and services that they have ordered. This is because saying the customers’ orders and total amount to be paid out loud may seem a bit troublesome and the customer might not hear it correctly. You may also like customisable tax invoice templates. 2. It provides both the customer and the restaurant a copy of the food and services purchased that will let them be used as their reference in the future. 3. Restaurants use invoices to keep track if their sales record for the day and for tax-filing purposes. 4. Restaurant invoices are also very useful documents when it comes to inventories as it provides the business with accurate data on how much of the stocks or goods have been used up and how many needs to be refilled or repurchased. 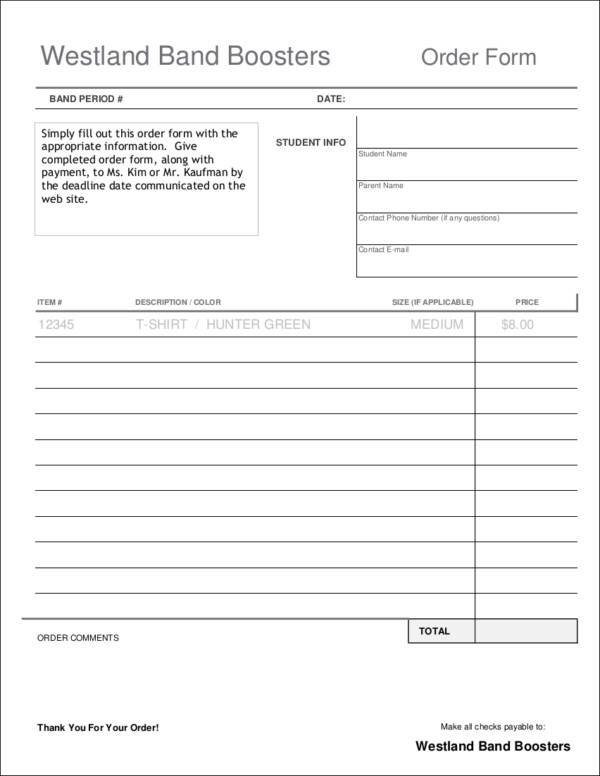 You may also check out education invoice samples & templates. 5. It is used to keep track of the earnings of the establishment for a particular period of time. 6. Restaurant invoice templates are used to quickly create a a restaurant invoice for the business conveniently, instead of writing all the details manually, which may take a lot of time and impede the other business processes. Have you used an invoice before? If you have, then what other uses of an invoice do you know that are not listed above? Invoices clearly have a lot of uses owing to the fact that it comes in different forms and used for different specific purposes. Other invoice-related articles you may be interested in are Retail Invoice Templates, Jewelry Invoice Samples and Templates, and Equipment Invoice Samples & Templates. You may check them out on our website. Is There a Need to Issue a Receipt after Issuing an Invoice? If you have tried dining in a restaurant, then you have probably noticed that there are two sets of documents handed to you. The first piece of document issued to you is before you make a payment. This is issued when you request for your bill. That piece of paper is the invoice. It gives you the details of list of the food and other services that you have ordered from the restaurant. After receiving and checking this invoice, you then give your payment. After making the payment, another piece of paper is handed to you by the waiter. This time it is no longer an invoice but a receipt. Why do they need to issue a receipt after the payment? The receipt is the restaurant’s way of acknowledging that payment has already been made for the food that you have consumed. If you did not get a receipt, that would probably mean that the payment you made was not passed on to the cashier to be registered in their system. You may also see landscaping invoice samples. Invoices and receipts are issued separately, but often on the same transactions. If you would like to know more about invoices and receipts, come and visit our website. We have there different varieties of invoices and receipts, such as repair invoice templates, self-employed invoices, and credit card receipt templates. 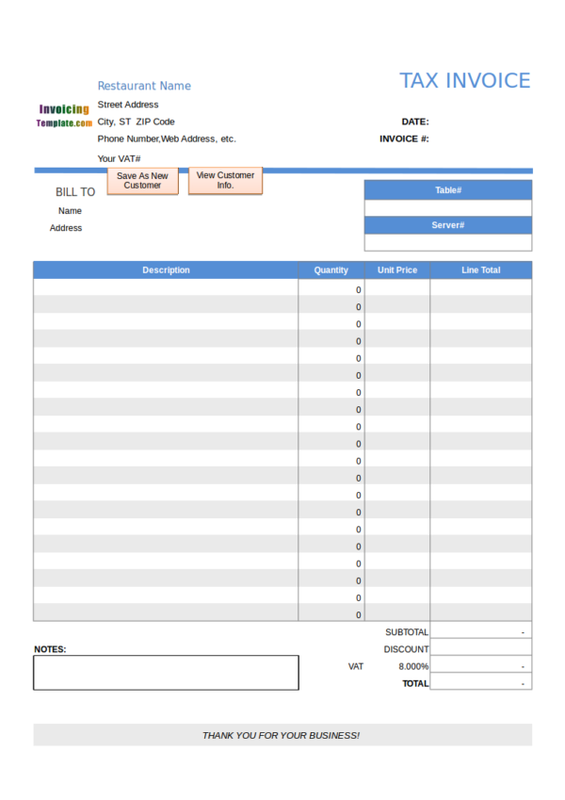 What Should Be Included in a Restaurant Invoice Template? When choosing a restaurant template for your restaurant business, it is important that you pay attention to the details or the inclusions of such template. Make sure that they are complete so that you can also give your customers’ complete details about their order. To do this you will need to know or have enough knowledge about what should be included in a restaurant invoice template. We have made a list of them below. You may also see daycare invoice templates. The contact details of the restaurant, which includes their phone or cell phone number, email address, fax number, and website. You may also like painting invoice samples. The name of the customer or the table number where the customer is seated. You may also check out hotel invoice samples. A restaurant invoice is almost the same as the other invoices that are used in different businesses or establishments. There are just a few items that may vary or may be different from the rest and they are those that are specifically used in the restaurant business. If you would like to know more about the other elements that you need to include in your invoice, you can compare different invoice samples and templates that are available to you or you can check them out on our website. A few notable topics are standard invoice templates and sales invoice templates. 1. 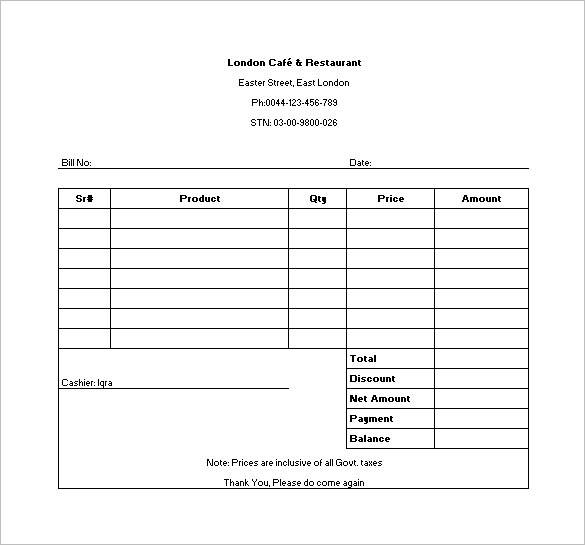 Restaurant invoice templates make it quick and easy for any to make or produce restaurant invoice that can be used in any restaurant business. 2. It offers a convenient of way of creating your own restaurant invoice templates. It not only saves you a lot of time, but it also allows you to save energy as you won’t have to deal with the hassle of finding a printing press or store that sells just the right type of template that you need. You may also see catering invoice samples. 3. There are different varieties and formats of restaurant invoice templates available to you online so you can surely find the template that you need best for your business. 4. Almost all of the awesome templates available are free for download online so you really don’t have to spend anything just to get the template that you want, saving you a lot of money and resources. 5. 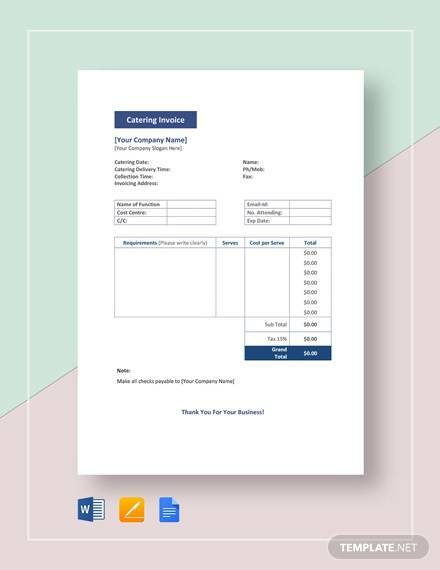 Ready-made restaurant invoice templates are guaranteed to always include a complete set of details of parts necessary for the issuance of accurate and reliable restaurant invoice to businesses’ customers. You will surely not miss any important details on your restaurant invoice. You may also like consulting invoice samples. That’s a handful of advantages you have there, don’t you think? Just imagine yourself doing the invoicing manually, like writing in the parts of the invoice and the list of orders at the same time. It is super time-consuming and straining. Why go through all that trouble when you have restaurant invoice templates to help you breeze through those things. Other related templates you may be interested in are advertising invoice templates, cash invoice templates, and vehicle invoice templates. 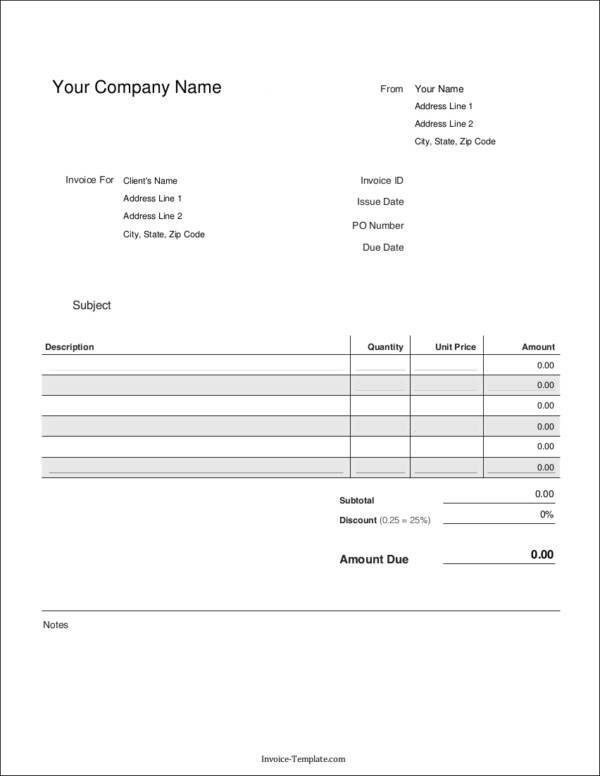 Making your very own restaurant invoice template is fairly easy. With the use of the appropriate tools and available resources, you can easily make one in a breeze. You don’t even have to be extra knowledgeable about invoices. We would like to help you as much as we can and that is why we have formulated steps that are easy for you to follow. You can also modify these steps according to your preference. You may also see printable service invoice templates. 1. 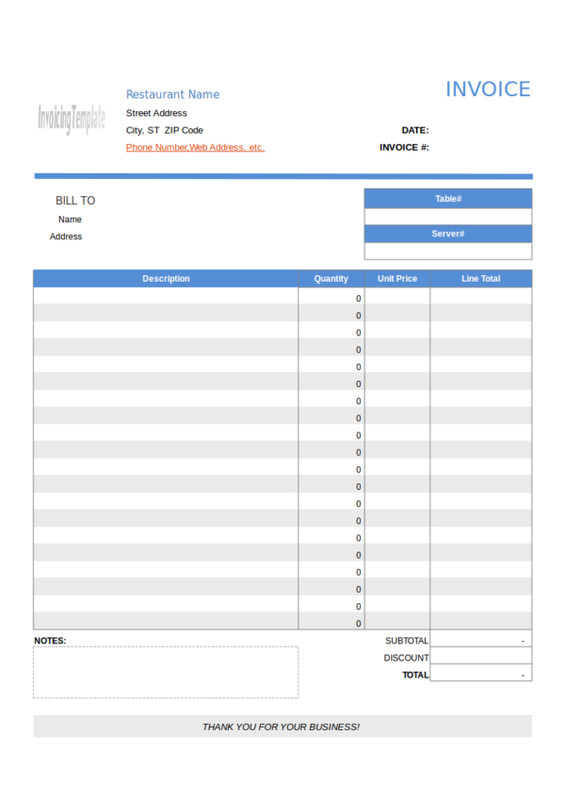 Think of the how you want your restaurant invoice template to look like. This is where you focus mainly on the layout or the outline of the invoice. 2. Next, decide on the details that you want your restaurant invoice template to include. You may refer to the list provided above. It is also okay to add other details or remove some details. This depends on your needs or how you do business. You may also like travel invoice samples. 3. After deciding on the details above, we will now proceed with making the actual template. There are two ways on how you can do it. One is with the use of a blank invoice template, which is appropriate for your needs, and the other way is by making the template from scratch. 4. If you wish to make the invoice using ready-made restaurant invoice templates, all you need to do is download the template file that you want to use and edit the details to your preference. It should be done within a matter of minutes. 5. If you wish to make your restaurant invoice template from scratch, then you will need an application that you find easy to use and navigate. It could either be a Word application or an Excel application. 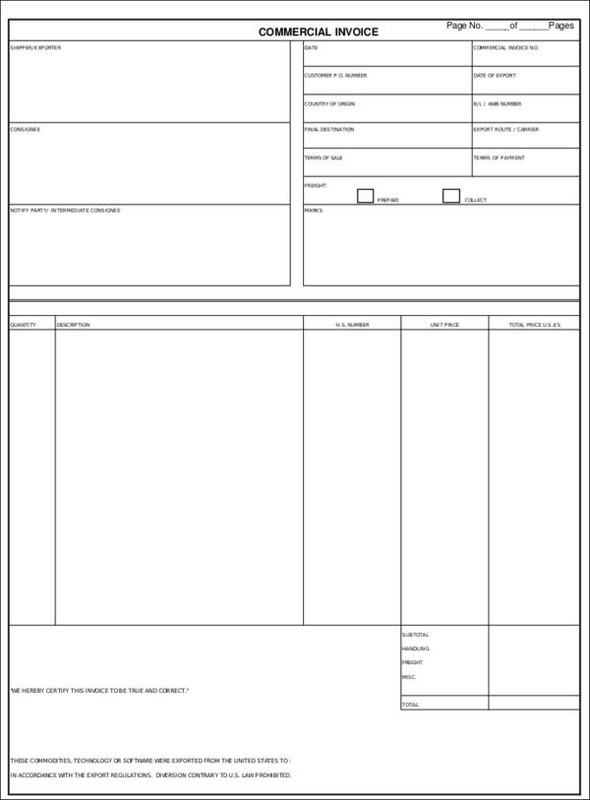 You may also check out vehicle invoice templates. 6. Open a blank sheet or a blank page and then work on the layout or outline of the restaurant receipt template that you have envisioned. 7. 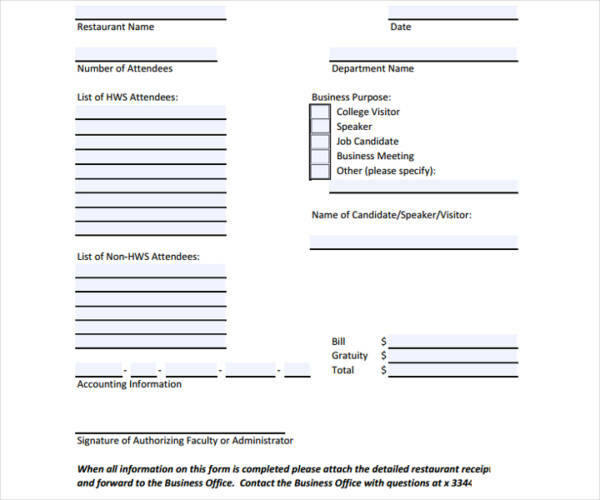 Next, fill in the necessary details to complete your restaurant invoice template. 8. Make the final revisions and changes to your template before finally saving it with your preferred folder with your desired file name. You might be interested in basic invoice templates. You can use the template that you have made from the steps above for as many times as you want. You can print copies to be used in your business any time you need to. We sure hope that you find this article helpful. If you ever need to learn more about invoices or need invoice samples or templates as your reference or guide, you can always drop by our website and check out different samples and templates we have available. To name a few are sample contractor invoices, photography invoice samples, and tax invoice templates.